Please be advised that the New York State Department of Environmental Conservation has drafted a proposal for regulatory changes to 6 NYCRR Part 230 Gasoline Dispensing Sites and Transport Vehicles. Please find attached a fact sheet outlining the proposed changes. 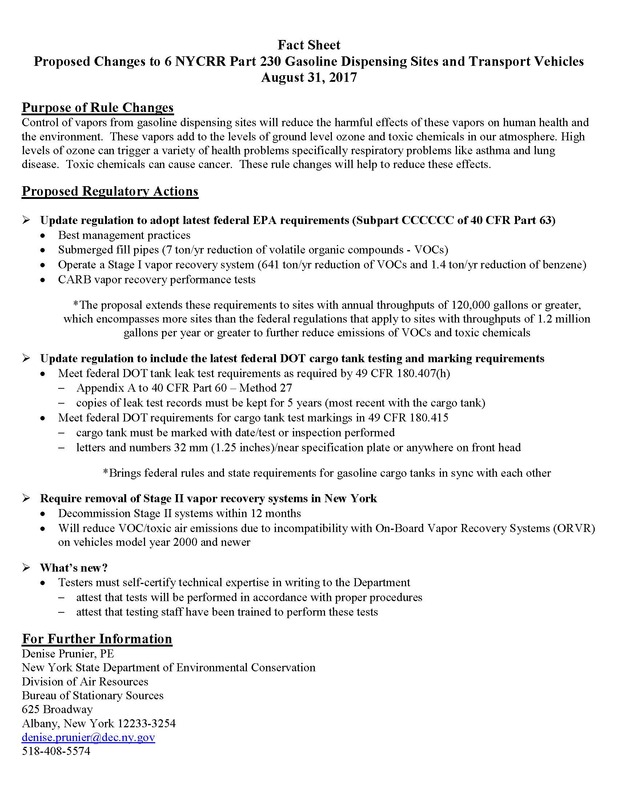 In addition to updating an obsolete regulation, the proposal adopts federal Stage I regulations that require specific vapor recovery system equipment along with best management practices, submerges fill pipes and CARB vapor recovery performance testing for all gasoline dispensing sites with annual throughputs of 120,000 gallons or greater. The Department’s proposal goes beyond the, already in place, federal regulation by extending these requirements to sites with annual throughputs between 120,000 and 1.2 million gallons. Furthermore, the proposal eliminated Stage II vapor recovery requirements in light of diminishing benefits due to incompatibility with on-board refueling vapor recovery systems (ORVR). It also replaces the gasoline cargo tank pressure test requirements with the latest federal DOT standards. Lastly, individuals who perform Stage I vapor recovery tests will be required to provide proof that they have the expertise to do so. Informational meetings are planned for the near future. You will be notified regarding the locations and times. If you are no longer interested in being contacted regarding changes to Part 230, please let me know.